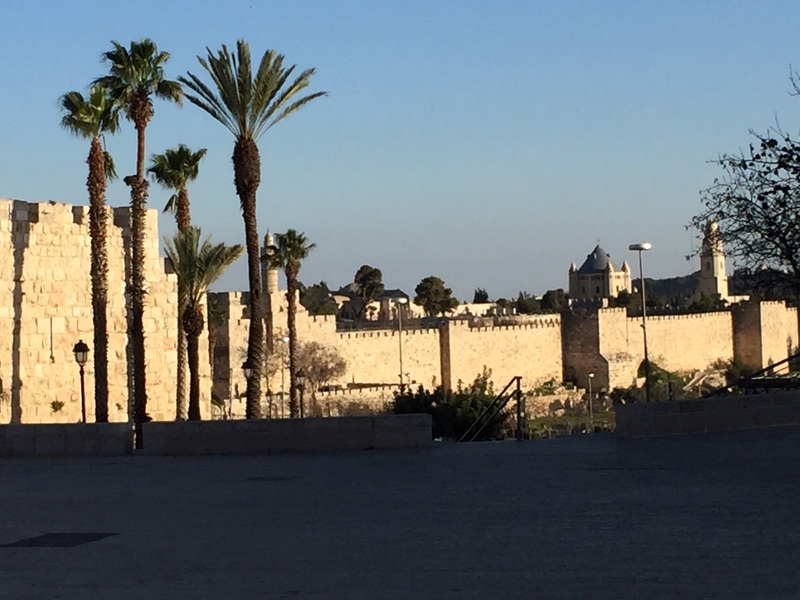 Jennifer and I arrived at the ancient gate of the old city of Jerusalem and we were both awestruck to be there. I couldn’t believe it actually – to be in a place with such historical significance felt surreal and was completely breathtaking. The walking tour we started with its facts and stories was interesting, but shortly after it started we fell behind and lost the group as my gimpy robot walk couldn’t keep up. 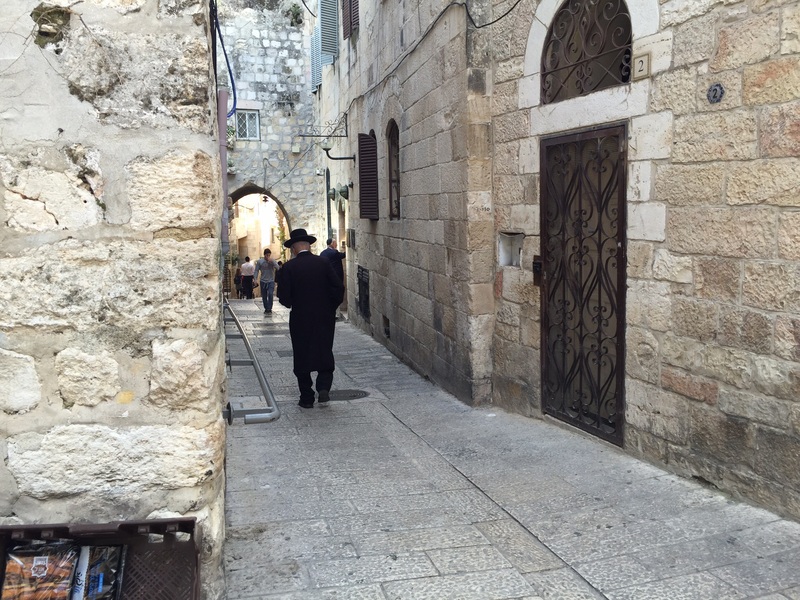 Jennifer staunchly stayed with me (her knee is finally doing better) and we wandered through the narrow winding alleyways of the four quarters; Muslim, Jewish, Christian, and Armenian, on our own. Down a small alley, a wizened old Jewish tailor beckoned us into his tiny shop where he had been sewing men’s suits for the last 57 years. Unbeknownst to him, a tailor was exactly what I needed. As Jennifer mentioned in an earlier blog, I had had a major seam failure days earlier down the backside of my pants (my big scarf saved my dignity once again as my undies had long since been tossed in a fit of unloading anything not absolutely essential). He repaired my well ventilated pants as I waited on a rickety old chair in a postage stamp sized fitting room. He entertained Jennifer with tales from the old days while he sewed. In The Holy Sepulchre we looked at the stone where Jesus was laid out and washed after he died. The story goes, that whatever touches the stone is directly blessed with His divinity. People were placing religious souvenirs to be blessed and (presumably)to be given to loved ones back home, others were crying and kissing the smooth rock. My belief system leans more towards pagan-based spirituality but I do think that the universal petitioning that seems inherent to humanity is powerful. I think everybody’s personal truth has power but that collective faith-based consciousness has even greater power, regardless of religion. I need all the blessings I can get, so I laid my forehead upon the rock and opened myself to what it had to offer. Curiously, the rock itself seemed to emanate gentleness. With my head still down I mentally explored whether it was my own imaginings…but either way, I felt almost magnetized to the revered rock. We sat there for a long time, heads down, almost caressing the centuries old smooth contours; anyone watching must have thought us very devout. When I lifted my head my life wasn’t changed but I did feel a sense of peace. Jennifer was also very moved. Before I left, I touched my hiking poles on the rock for good measure. Jewish tradition teaches that the temple of the mount is the focal point of creation. That in the centre of the mountain lies the “foundation stone” of the world. The Western (wailing) Wall is a remnant of the Temple Mount and Sages say that “the Devine presence never leaves the Western Wall”. Jewish people from around the world have been coming here for centuries to meditate and offer up their laments. They write their deepest hopes and prayers on little pieces of paper, rest their heads on the wall and stuff the paper into the walls crevices. Thousands and thousands of little papers from around the world are imbedded into the wall and have become an integral part of its uniqueness. I stood side by side with the faithful, rested my head on the wall and offered my own plea. I then backed away as they did, not turning my back to the wall. Shabbat is almost over and we are sitting in a beautiful room of the David Citadel Hotel overlooking the old city of Jerusalem. The hotel room is a Christmas gift from a Jewish friend and client who wanted us to enjoy this special place. The hotel is ranked as one of the ten best hotels in the Middle East and I can’t begin to tell you what a treat it is. We have been transported into a world of luxury, quality and refinement. When we dragged our bedraggled selves in, backpacks loaded, the front desk staff initially thought we had wandered into the wrong place, not being the typical clientele. But they have treated us like queens. Since arriving, we have lathered our faces with lemon scented lotion, soaked up the ambience of the executive lounge in green plush chairs, ate sushi, smoked salmon, and an array of delicious middle eastern salads and desserts (also included in the very generous gift). Looking out from our balcony under the starlit sky we marvel at our how fortunate we are. Wishing you peace and wishing Sabrina a pain free night recovering from her surgery. Shabbat shalom. The large mountain block called Masada sits at the fringe of the Judaean Desert and overlooks the Dead Sea. 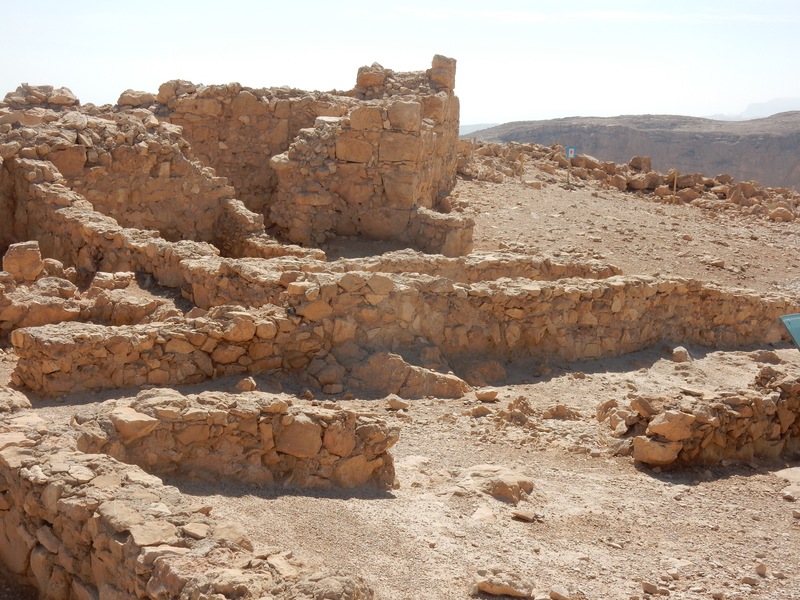 During his reign from 37 BC to 4 AD, Herod, king of Judea, built an extensive winter retreat on the high plateau. In 66 AD it was taken over by the last of the Jewish freedom fighters who found refuge there from the Romans. When it was clear to the rebels that the battle was lost, together they made the decision to die rather than be taken into slavery. Husbands killed their wives and children, and then themselves. Within days, the Romans breached the high walls and found the 900 Jewish rebels dead. In the Byzantine era, hermit monks occupied the mountaintop fortress for a few centuries and it has stood empty since then. When it was rediscovered in the 1800’s, the tragic events surrounding the last days of the rebels transformed Masada into both a Jewish cultural icon and a symbol of humanity’s continuous struggle for freedom against oppression. Wandering through the ruins of casement dwellings, ritual Jewish baths and synagogues, the air seemed to vibrate with echoes of the past. Sitting alone in “the library”, the pain in my ankles felt unimportant as I reflected on the communal decision to die as opposed to capture and abuse. Looking at the hidden wall niches where many artifacts were found, I could almost see husbands and wives clutching each other as they buried treasured family items and scrolled parchments before the mass suicide. Masada is the most complete surviving ancient Roman siege system in the world and stands as a powerful testament to the ideal of live free or die. After visiting Masada, we moved on to a totally remote location and had another Dead Sea experience. Two kilometres in from an empty road, our tents were dwarfed by towering cliffs on three sides and sat on a large rocky shore facing a wide expanse of Sea. We didn’t see another person at our isolated retreat for the three days we were there. It had an abundance of the smooth black mud that people pay big bucks for in spas. But many of our mud goddess photos will never see the light of day as I had the mistaken impression that, because it felt like I was wearing a body sleeve, it would look like one too. (When I saw the pics the thought that I had somehow been transformed into the sleek Mystique of the X-men was forcefully shattered). We looked exactly like what we were – 2 fun-loving aging women au naturele covered head to toe in mud! There was also a sulphurous hot spring right beside our tents where we soaked in exceedingly hot, salted, mineral rich water that bubbled up from some deep underground thermal activity. And again, I imagined Roman legions soaking in the same hot thermal waters. I wondered what it must have been like 2000 years ago to come upon such a phenomenon. (Ice would have been better for our ankles and knees but, alas, no ice came bubbling forth from the bowels of the earth). It was a lovely and restful but we had had our fill. Our water and food were almost gone, our bodies abraded by salt shards, every piece of fabric we brought was salt encrusted and stiff, but the most compelling reason for us to bid farewell to our private paradise was our skin – with no “sweet” (fresh) water to wash off the salt water, our skin was lizard tight, shrivelled, pickled and pruned. So, after a nutritious breakfast of powered eggs a la grit, and liquorice wash water tea, we packed up and limped off towards Jerusalem!